I’ve been tantalizing you with Champagne cocktails all week but haven’t really been pointing you in any specific direction on the choice of Champagne. Let’s see if we can’t rectify that with this post. I’m going to offer you two paths. The first is to do your homework, understand the basics, seek some advice and then make an educated decision. The second path is way simpler, just use my suggestions and happily enjoy. While this is the more complex path I’m going to keep it relatively simple for you. Step 1 – Do some basic research. I’d start with a quick read of Wikipedia, as any good geek would suggest. There is a lot of great info on there about growing regions, naming requirements, etc. Given that wealth of information, I’d recommend you focus on a few facts. One, if the wine isn’t from the Champagne region of France it’s not really Champagne. One-B, despite this regulation, there are some great “Champagnes” from other places around the US and the world. Two, there are a range of sugar contents and each has an associated name. For most mixing I’d stick with Brut. It’s a dry option which will allow you to adjust the sweetness of your drinks as you see fit. For drinking straight I also lean towards Brut, but there are other options depending on your preferences. Three, there are a variety of Champagnes that are classed based on their grape composition. For example a “Blanc de Blancs” is composed completely of Chardonnay grapes, whereas a “Blanc de Noirs” is a combo of Pinot Noir and Pinot Meunier grapes. That said, a lot you find simply won’t say, and that’s fine too. Step 2 – Okay, now you’ve got the basics down, how about some suggestions? Well, naturally you can go lots of places to seek this advice. My personal suggestion is to first talk to friends and family. Chances are, if they’re wine appreciators they’ll have some suggestions for you. As a second option here are some resources that know more about wine than I do. Gary Vaynerchuk of Wine Library TV has a number of episodes about sparkling wines. This episode is one of my favorites and covers a huge range, both in style and price. Ben Carter of Benito’s Wine Reviews put up a post last year on some of his personal recommendations. Finally, I’ll point you to a series of posts on Fredric Koeppel’s blog Bigger Than Your Head where he covers a lot of sparkling wine options. Okay, here’s the compressed, ADHD version for the attention challenged among us. Mixing – Gruet Brut. It’s fairly cheap, my bottles were on sale for $12.49, usually $16.99. Better still, it’s good stuff. I’d drink it straight and it blends well in cocktails. Drinking Straight – Schramsberg Brut Rose. Although my personal choice is the Rose their Blanc de Blancs and Blanc de Noirs are also very good. These are more expensive choices, about $40. You could certainly use them for mixing, but I’d say just drink they alone in a flute instead. So there you have it. Some guidance on education and selection and the quick approach to the problem. Let me know if you have any great recommendations to share with everyone. 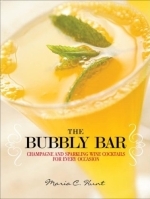 In flipping through The Bubbly Bar I noticed a classic Champagne cocktail that I’ve been wanting to mix up for a while now, the Kir Royale. This drink has an interesting past as well. The drink that started it all was blanc-cassis, a blend of dry French white wine and creme de cassis. 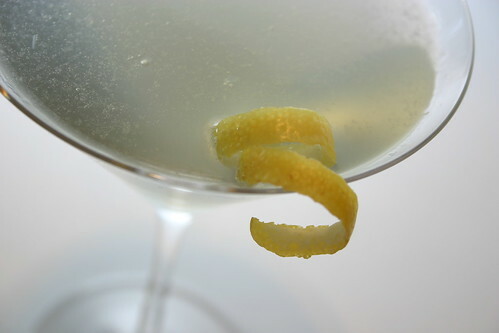 After World War II the drink was renamed to honor the then mayor of Dijon and prominent member of the French Resistance during the war, Felix Kir. And thus, the original Kir was born. There are a number of variants on the classic Kir. The best known being our pick for today, the Kir Royale. 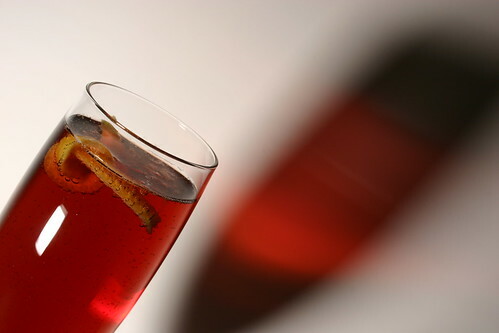 The Kir Royale is truly elegant in its simplicity. The color that the creme de cassis brings is a lovely maroon. The berry flavor is bright but not overpowering or overly sweet. 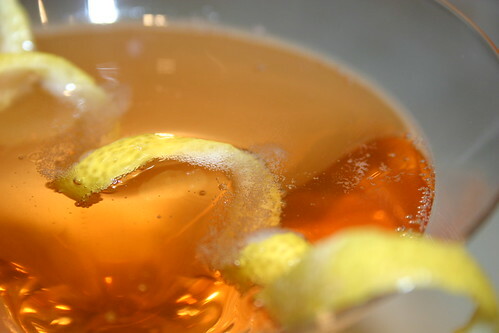 In this drink’s case that lemon twist isn’t solely for decoration, either. It adds a nice citrus note to the aroma and flavor. This really is a delicious drink and I think it would work great for a party. It’s a tasty twist on standard Champagne, simple enough that people can mix their own and packs a bit lighter punch than a French 75.